DONETSK, Ukraine -- On school days, Vladimir rides the bus into the city center to teach gym class. A rebel commander, named Givi (R), directed an assault on the Donetsk Airport from a nearby apartment high-rise. On the weekends, he remains at home in his dark, unheated apartment and tries to ignore the shots ringing out from the floors above. “There is no water, no electricity,” he said as he showed off his first-floor apartment, recently renovated with wallpaper resembling exposed brick, a laptop on his desk, and a dozen religious icons on his windowsill. Vladimir, who did not give a last name, is one of three people who still live in the high-rise, which has an excellent view of what was once the jewel of eastern Ukraine, the Donetsk International Airport. Seven stories up, a veteran rebel commander who goes by the code name Givi runs a war supposedly on pause from an apartment kitchen. From his vantage point near the airport on Saturday, he directed ceaseless volleys of tank, artillery and rocket fire into the burned-out terminals and hangars. He has become something of a local celebrity after a YouTube video titled “Givi’s Unit” showed his fighters charging onto the tarmac on a tank. In one scene, he berates a Ukrainian Army colonel by telephone in deep, guttural Russian for violating the shaky cease-fire agreement signed in early September. “Leave the airport,” he says in the video. On Saturday, he juggled two telephones and a radio, attempting to coordinate the assault. “The tower! The tower!” he yelled into a smartphone as large as his face as an automatic grenade launcher in a neighboring apartment fired toward the airport. The counterattack came like clockwork. Dozens of rockets took flight with a rapid-fire whoosh, sailing in the direction of the high-rise. But, just as they have for almost a week now, they missed and landed in a nearby row of single-story houses. “They shoot everything except what they are supposed to,” observed one rebel, Igor, as he notched new grenade rounds into a circular magazine. It is a vicious cycle of attack and response that has sent civilian deaths soaring in recent days. As rebel forces with heavy artillery have ensconced themselves near the airport, sometimes in civilian neighborhoods, Ukrainian forces have responded with heavy, often ill-directed fire. The result has been catastrophic. On Wednesday, nine people were killed when Grad rockets hit a city bus and an elementary school on the first day of classes, including a teacher and a parent who was at the school. The next day, an artillery round struck the offices of the Red Cross in the center of the city, killing a Swiss employee of the organization. On Saturday, the rocket strike killed one woman. A second woman, covered in blood, was bundled into a blanket by several rebel medics and taken to a hospital by car. A woman sobbed uncontrollably on the street. Another flung a fuming hunk of metal from a shell onto her front yard, cursing President Petro O. Poroshenko. “Look what came flying into my house!” she yelled. After Wednesday’s strike, Amnesty International called the attacks unlawful, saying that Ukrainian forces were using weapons in populated areas that could not be targeted with sufficient accuracy to avoid civilian casualties. A spokesman for the army has denied that Ukraine is shelling civilian areas in Donetsk, instead blaming rebels for the violence. 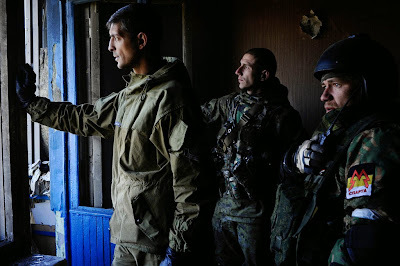 “We will continue pushing them back,” Givi, the rebel commander, said briefly before charging down the stairs with a small retinue. Downstairs, an elderly man on a bicycle who said he did not want to give his name pedaled into the lobby of the building. His wife is sick, he said, and they cannot move out. Several days earlier, a Russian state television reporter running up the stairs stopped a woman to ask if she was scared to live in the building. They exchanged hellos in a cutaway so curt that it seemed humorous. “Aren’t you afraid to live here?” the reporter asked. “No, I’m not afraid,” she replied. A strange routine continues in the neighborhoods near the airport. On Saturday, a garbage man jogged alongside his truck just a block from where the rocket struck. He snatched plastic bags of waste off trees as tanks passed on a neighboring road. Vladimir said he was afraid, but also tired of moving. His hometown, Snezhnoye, has been severely damaged in the fighting. He used to live in a three-room apartment in a different region of Donetsk, but moved into the first-floor apartment because it seemed safer. “A man’s home must be his castle,” he said, walking through the battered hallways of the high-rise. He clucked his tongue at a broken hallway gate on the third floor. He supports the separatists, he said, but hopes for the sake of his apartment that the fighting will end soon. Quote: «Институт военных гауптвахт, который был всегда в Вооруженных силах, право командира на привлечение к ответственности военнослужащего, который не покоряется приказу путем наложения ареста и перемещения его на пребывание на гауптвахту, был довольно действенным. На данный момент этого по законодательству нет, и командиры военных частей и соединений испытывают большие трудности с применением каких-либо инструментов влияния на военнослужащих», - сказал Матиос журналистам в воскресенье на полигоне в Харьковской области, сообщает «Интерфакс-Украина»." It is a good idea and should be implemented soon. I wounder about Ukrainian Military Police, it must perform similar functions. There should be experienced military police who served in Iraq.